The best woodfiller we have ever used, this filler will not shrink, sink, crack or fall out. You will never have to worry about shelf life again because this product has none. If the filler starts to dry out, it can easily be reconstituted with a little water. It is truly water based and is freeze and thaw stable. This product has multiple uses including filling spots, holes, trowling and as a grain filler. Mixes perfectly with oil or latex tints and takes stains just like real wood. Custom colors can be accurately reproduced for any project. Individual colors come in an 8oz. or 1 Quart re-sealable container. 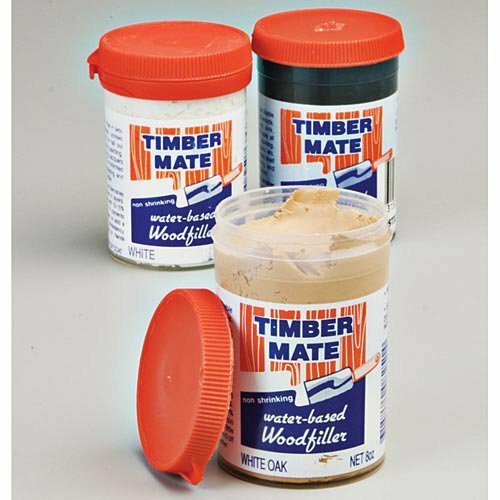 If you have any questions about this product by Timbermate, contact us by completing and submitting the form below. If you are looking for a specif part number, please include it with your message.